The year 2017 marks the 100th anniversary of women’s suffrage in New York State. 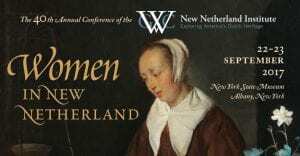 The New Netherland Institute (NNI) is using this centenary and its Annual Conference on September 22 and 23, to highlight the important role of women in the development of the seventeenth-century Dutch colony of New Netherland and in early New York. NNI will host speakers from both academic and non-academic backgrounds, including first-time and returning presenters, to this year’s event. In addition to the conference, NNI will host its annual dinner on Friday night at the Hampton Inn in downtown Albany. The dinner will feature a talk by historical artist Len Tantillo and the presentation of this year’s Hendricks Award and the Clague & Carol Van Slyke Article Prize. The meal will be a rijsttafel prepared by Yono’s Restaurant. NNI has also arranged a tour at Crailo State Historic Site for conference attendees. Crailo will present “Women of New Netherland,” a new tour focusing on the lives of women during the Dutch colonial period, at 2 pm on Saturday, September 22nd. Visit the New Netherland Institute website for more details and registration.